Green Terror Football Team Camp consists of 8 practice opportunities. 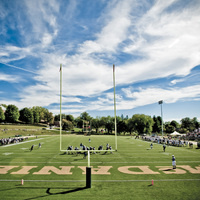 Afternoon practices will be conducted by the McDaniel College coaching staff, and 7 v 7 tournaments occur at night. Great opportunity for team building and exposure to college coaching. Elligible participants are students in grades 9 through 12. Overnight and Commuter options available. For more information, contact Chris Bassler at cbassler@mcdaniel.edu.